Many people at St. Patrick's Cathedral in Manhattan said they said a prayer for Notre Dame Cathedral in Paris, which was engulfed in flames on Monday. Checkey Beckford reports. Cardinal Timothy Dolan, the Archbishop of New York, went to the city's St. Patrick's Cathedral to pray as Notre Dame's famed cathedral went up in flames Monday, its iconic spire collapsing as scores battle the rampant fire. "I just went next door to our own beloved Cathedral, Saint Patrick's, to ask the intercession of Notre Dame, our Lady, for the Cathedral at the heart of Paris, and of civilization, now in flames!" Dolan tweeted. "God preserve this splendid house of prayer, and protect those battling the blaze." The FDNY also tweeted out a statement from Commissioner Daniel Nigro about the massive fire and those working to extinguish the flames. "Images of Notre Dame in flames are an awful sight to behold," the FDNY tweeted. "The thoughts of the FDNY are with the members of @PompiersParis as they bravely battle this terrible fire in one of the world’s most beautiful and historic houses of worship." 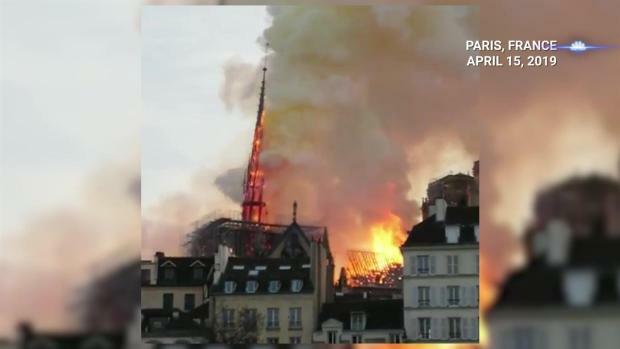 The spire of the iconic Notre Dame Cathedral collapsed Monday after a fire broke out in the Paris cathedral. Gov. Cuomo also tweeted: "New York aches. Our prayers are with the people of France and the first responders." The U.S. Conference of Catholic Bishops also issued a statement on the devastating Notre Dame Cathedral blaze. 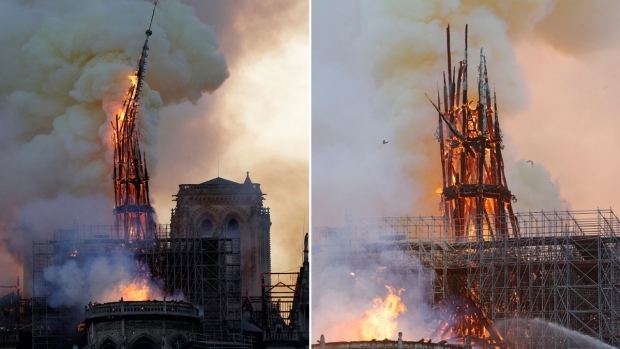 "The horrific fire that is engulfing the Cathedral of Notre-Dame de Paris is shocking and saddens is all, for this particular cathedral is not only a majestic Church, it is also a world treasure," the statement reads in part. "Noble in architecture and art, it has long been a symbol of the transcendent human spirit as well as our longing for God." Local archdioceses also mourned the fire that engulfed the iconic house of worship. The Diocese of Camden in New Jersey called the event "a great tragedy." "Our prayers go out to the people of Paris and all people who loved this beautiful Cathedral," the diocese said. Meanwhile, the Diocese of Metuchen, also in New Jersey, simply tweeted: "Please pray for the people of Paris." 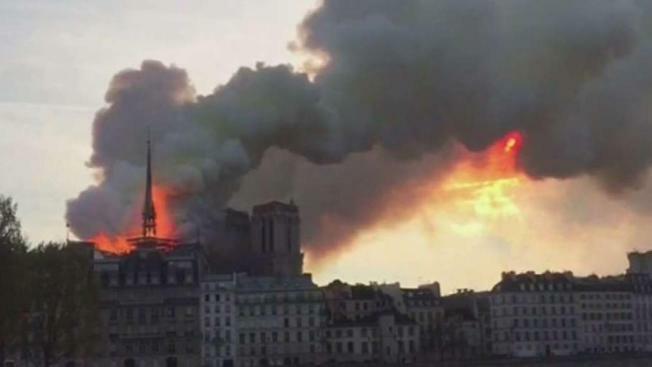 Millions across the globe watched in horrified awe Monday afternoon as flames broke out at the Notre Dame Cathedral, spewing smoke over the city of Paris before toppling the spire and reducing much of the holy building to rubble. Paris Mayor Anne Hidalgo called the fire "terrible" in a tweet. She and local police asked the public to avoid the area. "Like all our compatriots, I am sad tonight to see this part of us burn," Macron tweeted in French. Investigators are treating the massive blaze as accidental for now, as the prosecutors ruled out arson. The fire came during the Catholic Church's Holy Week, days before Easter. The blaze drew the attention of U.S. President Donald Trump, who tweeted, "So horrible to watch the massive fire at Notre Dame Cathedral in Paris. Perhaps flying water tankers could be used to put it out. Must act quickly!"